New Farm Stand products now available through this web site. Order in advance and pick up your produce at the farm stand nearest to you. For the past 10 years Marin Community Farm Stands has brought the bounty of Marin organic produce to the towns of Ross, San Anselmo, San Geronimo and Woodacre. 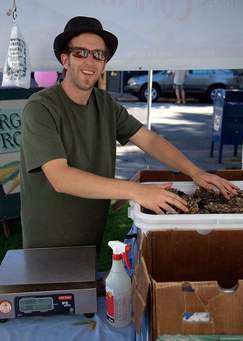 MCFS represents the cooperative efforts of over 20 Marin Organic producers and artisans from the communities of Bolinas, Point Reyes, Inverness, Lagunitas, Nicasio, Petaluma, Sebastopol, Tomales, San Anselmo and Fairfax. We are a Marin Organic Supporting Business Member. As we enter our 10th season I want to thank you for supporting local sustainable agriculture and following the Marin Community Farm Stands & CSA. As you know, I offer only the finest produce and products that are seasonal, organic, and locally grown. I hope to see you at one of my farmstands soon.